Make other changes in your lifestyle . Change your daily schedule and habits. Eat at different times, or eat several small meals instead of three large ones. Sit in a different chair or even a different room. Enroll in a stop smoking support program . Hospitals, health departments, community centers, and work sites often offer programs. Learn about self-hypnosis or other techniques. Ask your health care provider about medicines that can help you quit nicotine and tobacco and keep you from starting again. These include nicotine patches, gum, lozenges, and sprays. The website Smokefree.gov also provides information and resources for smokers. Calling 1-800-QUIT-NOW (1-800-784-8669) will direct you to a free telephone counseling program in your state. Benowitz NL, Brunetta PG. Smoking hazards and cessation. In: Broaddus VC, Mason RJ, Ernst JD, et al, eds. Murray and Nadel's Textbook of Respiratory Medicine . 6th ed. Philadelphia, PA: Elsevier Saunders; 2016:chap 46. Rakel RE, Houston T. Nicotine addiction. In: Rakel RE, Rakel DP, eds. Textbook of Family Medicine . 9th ed. Philadelphia, PA: Elsevier Saunders; 2016:chap 49. US Preventive Services Task Force. Behavioral and pharmacotherapy interventions for tobacco smoking cessation in adults, including pregnant women: US Preventive Services Task Force Recommendation Statement. Ann Intern Med . 2015;163(8):622-634. PMID: 26389730 www.ncbi.nlm.nih.gov/pubmed/26389730 . 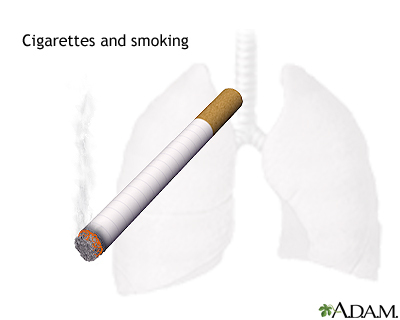 You probably know by now that smoking damages your lungs, raising your risk for bronchitis, emphysema, and lung cancer. And, you're probably well aware that lighting up also puts you at risk for many different types of cancers, as well as eye disease like cataracts and premature wrinkles, you know why you shouldn't smoke, it's just the quitting part you can't seem to get past. Let's talk about some helpful tips to help you quit smoking, for good this time. It's a familiar story, one that plays out over and over again among smokers. You vow to quit, and you have every intention of doing it, and then the cravings hit. And you can't think about anything but having a cigarette. You get irritable, and you start putting on weight. You think, Just one cigarette wouldn’t hurt, would it? And then, before you know it, you're smoking again. Most smokers have tried to quit, and failed, several times. Even if you've failed before, you can still succeed at quitting. Many people have. You just need to find the technique that works for you. So, here are a few tips that can help. First, set a quit date. Write it down on your calendar and tell a few friends, so you'll be too embarrassed to back out. Before your quit date, throw out every cigarette in your house, car, and office. Also toss every ashtray, lighter, and anything else you need to smoke. Wash your clothes and clean your furniture so you won't have that smoky smell hanging around your house. Next, call your doctor. Ask about smoking cessation programs in your area. Also learn about tools that can help you quit, like medicines that reduce the urge to smoke, and nicotine replacement gums, lozenges, patches, and sprays. And then, plan what you'll do instead of smoking. If you smoke with your morning cup of coffee, drink tea or go for a walk instead. If you need a cigarette to keep your mouth busy, try chewing sugarless gum or nibble on a carrot stick. Stick to places where smoking isn't allowed, like smoke-free restaurants. And finally, reward yourself for not smoking. Put all that money that you would have spent on cigarettes into a jar. And once you've collected enough money, use it to take a trip or buy something you've wanted for a long time. Don't get discouraged. Quitting smoking isn't easy. If it were, everyone would have done it by now. Be persistent, reward yourself for the progress you've made, and keep at it until you finally conquer the urge to smoke. The many methods of quitting smoking include counseling and support groups, nicotine patches, gums and sprays, and incremental reduction.